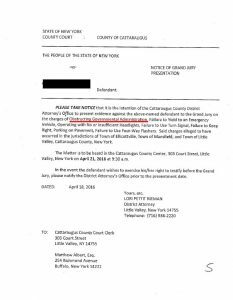 The victim was at the bench when he noticed the criminal Ensell looking back towards the prosecutors table, so the victim looks back and low and behold the thing that puts herself out as the Cattaraugus County District Attorney had slithered in and taken a seat at the table. However she was not composed at all. She had her hands crossed and was shaking. Being just a glance the victim thought to himself “did I just see what I thought I just saw”, so he glanced back and sure enough, she was shaking uncontrollably. She would then yell out “don’t you stare at me”. The victim would then ask for her conduct to be placed on the record, which for some strange reason it was missing in part, however the court reporter did manage to get some of it down. She is not fit to act as the district attorney. Plain and simple. 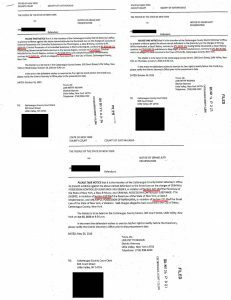 The image of lawsuit concerning her and her employees mental states is at the bottom of this page. In order to appeal a conviction in New York the individual appealing and the opposing party must agree on what should be contained in the record that the Appellant court can review. The record can contain motions and other pleadings, transcripts and evidence. Once the parties agree they sign an agreement to the record, called a stipulation. 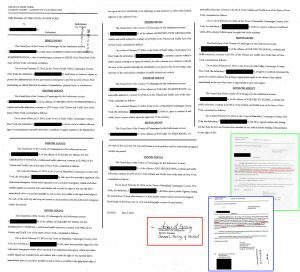 In this matter the victim served on “District Attorney” Lori Rieman on October 28, 2017 a proposed record. Rieman stated she would get back to him on it within two to three weeks. As expected, Rieman did not get back to the victim. This proposed record was much smaller than the full record, which the full record is around 2000 pages. Ten copies of this record and two to the opposition is required to be served, that’s 22,000 pages. Rieman did not respond in any manner and based on that and her criminal unstable nature the victim decided to serve another proposed record in late December, this time including the whole record so Remain and Ensell couldn’t nit-pick. The victim served the same proposed recorded again in January because he found some page numbering issues. As usual Rieman did not respond. Just shows you what sniveling little whining criminal Rieman is. If the parties cannot come to an agreement the person appealing can take it before the court for an order settling the record, so that is what he did. Assistant District Attorney Elizabeth Ensell LaFleur has been representing the people in this matter from the beginning. 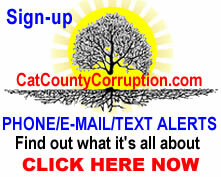 A criminal in her own right, Elizabeth is the same individual who, when she is not covering up her own crimes in collusion with the Olean Police Department, her and her father are covering up her sister’s assaults and drug dealing around the county. 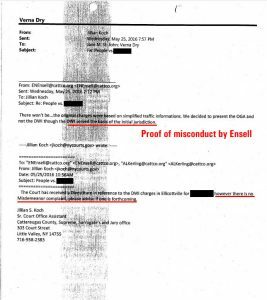 Ensell LaFleur would strenuously object to the victim’s inclusion of an e-mail document in the proposed record he had received from the court clerks office informing him that “DA” Lori Rieman had taken the two traffic violations to the grand jury using the direct presentation/indictment process. 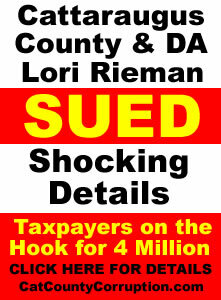 Direct presentations/indictment are reserved for only the most serious of crimes like murder, gang related crimes and drug dealers, however in this county Rieman considers the exercise of a Constitutional right a serious crime. 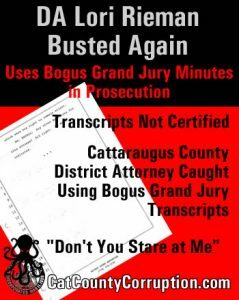 In a direct presentation the allegations are presented directly to the Grand jury before charges are filed, if an indictment is handed down an arrest warrant is usually issued and they go pick up the suspect and arraign them. One of the main purposes of this type of indictment is so the target does not flee. No arrest or formal charge has been made before the indictment is handed down (United States v. Marion, 404 U.S. 307, 324). However in this matter the victim had already been arrest and charged with one misdemeanor and two traffic citation and the case was proceeding in a lower court. 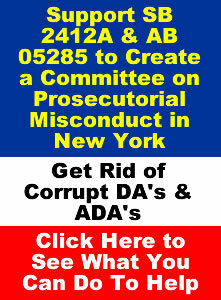 In New York state felony charges are automatically sent to a superior court, in most cases the county court. A person has the right to waive a grand jury presentment or they can chose to let a grand jury determine if the charge is valid. 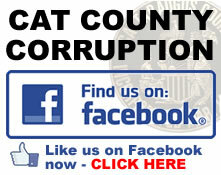 If the grand jury passes down an indictment it is moved to county court. I am sure you have heard of the phrase “a prosecutor can indict a ham sandwich”, which was actually first spoken by a well known judge here in New York. 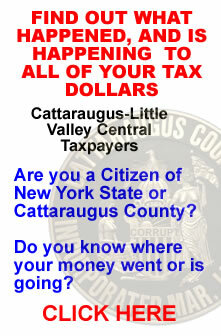 However this is Cattaraugus County New York. In this county you don’t even need a ham sandwich which will be explained later in this article. Once you are arrested and charges filed, and none of the charges are felonies, the only method that allows a misdemeanor charge to be taken to a grand jury is CPL 170.20 (2). Traffic violations are not allowed to be taken before a Grand Jury unless there is a felony or misdemeanor charge included in the same ‘criminal transaction’. Rieman and Ensell’s victim had been arrested on a bogus DWI and two traffic violations (basically parking tickets) on February 27, 2016. In late March of 2017 the DWI forensic results came back and it proved that the victim was not driving while intoxicated. All that Rieman and Ensell had him on was two traffic violations. Then on April 18, 2016 the victim’s attorney was served with a notice of presentation that listed one misdemeanor and nine traffic violations charges. 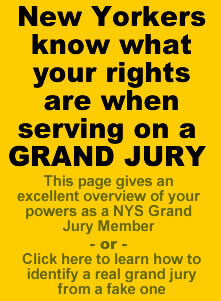 Traffic violations cannot be taken to the Grand Jury. The only problem was the misdemeanor charge listed the victim was never charged with, thus the unstable Lori Reiman and Elizabeth Ensell LaFleur did not have the authority to take the matter to the grand jury. Even a court clerk pointed that out and Rieman and Ensell LaFleur ignored it. The ham sandwich was missing. 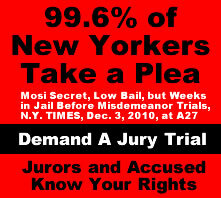 If at any time before entry of a plea of guilty to or commencement of a trial of a local criminal court accusatory instrument containing a charge of misdemeanor, an indictment charging the defendant with such misdemeanor is filed in a superior court, the local criminal court is thereby divested of jurisdiction of such misdemeanor charge and all proceedings therein with respect thereto are terminated. At any time before entry of a plea of guilty to or commencement of a trial of an accusatory instrument specified in subdivision one, the district attorney may apply for an adjournment of the proceedings in the local criminal court upon the ground that he intends to present the misdemeanor charge in question to a grand jury with a view to prosecuting it by indictment in a superior court. In such case, the local criminal court must adjourn the proceedings to a date which affords the district attorney reasonable opportunity to pursue such action, and may subsequently grant such further adjournments for that purpose as are reasonable under the circumstances. The presentation also listed the time to appear before the grand jury if the victim wished to do so. It was for April 21, 2016, three days after the victim attorney was served with the notice of presentation. 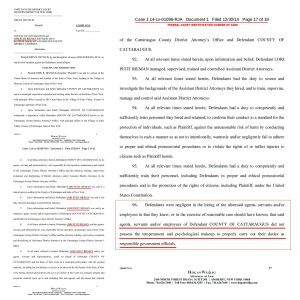 Three days was not enough time to prepare for the Grand Jury, especially given the fact that the notice of presentation was facially flawed, it did not actually list the violation of laws that were going to be presented. This is called “void for vagueness” and renders the document void (People v New York Trap Rock Corp 57 NY2d 371 ). 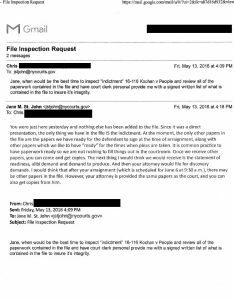 This was more evidence of Reiman and Ensell’s criminal vindictiveness. In all other notices the violation of law to other victims were actually cited. ctim was being charged with at least 22 charges. Three days is not enough time to prepare for a grand Jury. They did this in order to confuse the victim unlike all other Notices that she had filed in the past that actually cited the alleged laws violated which was another violation of the victim’s due process rights. The Grand jury passed down ten counts, or did they? The indictment alleged nine traffic violations and one misdemeanor, the Obstruction of Governmental Administration. Here is where the Grand Jury issue gets interesting. Two of the four counts were “multiplicitous” , two counts of VTL 1120(a), and two counts of (VTL 1144a). Multiplicitous is when a single offense is charged in more than one count (People v Senisi, 196 AD2d 376 [2d Dept 1994]) through uninterrupted conduct. For example, if you were to stab someone, like Ensell’s sister did, and stabbed them four times within say one minute you can only be charged once for that, its call the same criminal transaction, however if you stab someone, leave and come back, say thirty minutes later and stab the victim one more time that would be considered a separate incident and you could be charged again. If the charges are Multiplicitous one has to be dismissed. On top of that another count in the indictment “drivers view obstructed” has been ruled unconstitutional VTL §375(30) (People v O’Hare 73 A.D.3d 812). A grand jury is provided grand jury instructions which basically defines the law and the conduct that would be required in order to find reasonable cause someone had committed a crime. Further the instructions to the grand jurors “may not be so misleading or incomplete as to substantially undermine the integrity of the proceedings” People v. Caracciola, 78 N.Y.2d 1021, 576 N.Y.S.2d 74 (1991). The victim, in his omnibus motion asked for a copy of the instructions… guess what the court refused to give him. One must wonder why. How ever the biggest bombshell that caused the hearing to go into immediate sidebar (off the record) and the court law clerk to join in was when the victim pointed out the fact that the Grand Jury minutes were not certified, i.e. they were not signed by the court reporter. 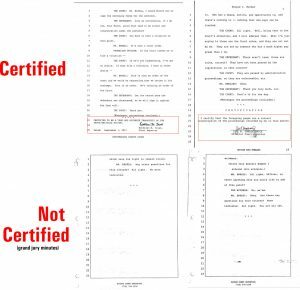 If it’s not certified, its not official and cannot be used. Ensell tried to make excuses for this other criminal act by implying the certification did not have to be included. The victim responded by showing examples that it did. In all cases the certification comes right after the last testimony entered. Let’s see if Ensell, Rieman and others fabricate more evidence in the form of a certification to cover up this latest uncovered crime of theirs. Also, it took close to 60 days to produce the Grand Jury minutes, i.e. transcripts, which never should have occurred they should have been availabel right away. It appears that the victims alleged ‘criminal’ matter may have never been presented to the Grand Jury. About this time the victim glanced over his right shoulder and saw that Rieman had slithered in and was sitting with her arms crossed at the prosecutors table and appeared to be shaking. 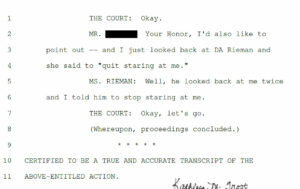 The victim glanced back again to confirm that he had seen Rieman shaking and Rieman yelled out “Don’t you stare at me”. More proof that she does not “possess the temperament and psychological makeup to properly carry out their duties as responsible government officials”, which is clearly stated in a lawsuit that was filed against her and her office in federal court.